Rosedene Guest House was established over 20 years ago by a Yacht Captain, Nick, during a stop in Cape Town on a world cruise. His goal was to create a Guest House with an informal welcoming Home from Home feel, with friendly and informative staff to help visitors make the best of their stay in Cape Town and its surrounds. Rosedene Guest House had its origins as part of a rose farm on the slopes below Table Mountain dating back to the 1800’s. The house has over the years had a number of conversions and additions, the latest of which has converted the property into an 18 room Guest House. The accommodation is made up of ten rooms in the main house, a detached suite over looking the plunge pool and four two-bedroom cottages. The courtyard and garden setting creates a tranquil ‘village like’ feel to the Guest House even though it is located in the centre of the city. 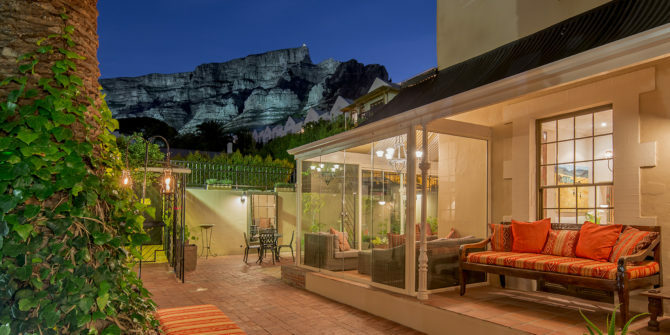 The covered verandas (stoeps), decks and courtyard have magnificent views of Table Mountain, Lions Head, Signal hill, the City and Table Bay. The Guest House is also situated on trendy Kloof Street, and close to Long Street and Bree Street. These have a huge range of restaurants, bars and shops, making it ideal for those who wish to stay in the city for business or pleasure. The V&A Waterfront is only ten minutes away and there is easy access to the rest of the Peninsula, the Wine lands and start of the Garden Route. Stays include full English and Continental style breakfasts.